Includes a full 10 color alphabet! Who doesn't love snuggling up with a good book and a great cup of tea? Warm & Cozy will help you document those cherished moments. Set of TWELVE 12x12 Papers and 50+ elements celebrating friendship and kinship. Great for both digital scrapbooking and hybrid projects! Set of 50+ elements celebrating friendship and kinship. Great for both digital scrapbooking and hybrid projects! Love pocket scrapbooking? 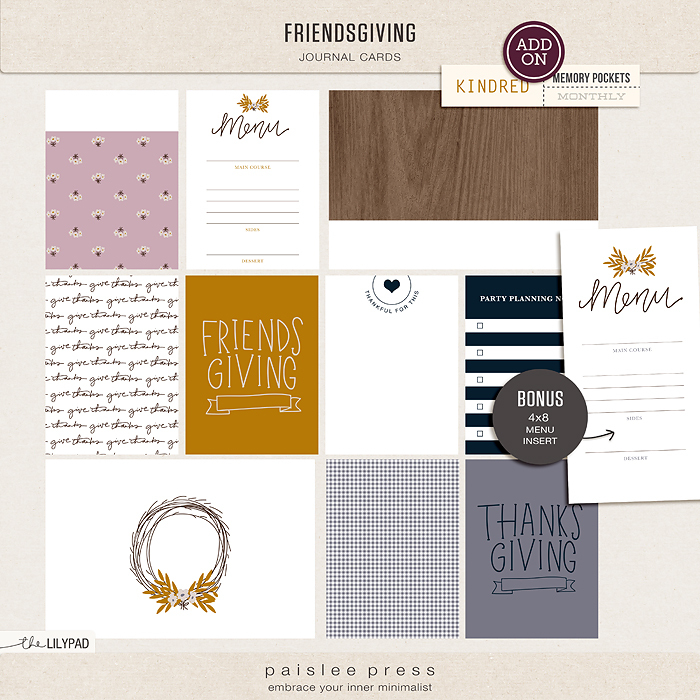 This set of templates makes it easy to snap in your favorite pictures and cards with ease and create gorgeous layouts. Each template comes with a few little add-on elements as well. Templates are 12x12 300ppi format. Each element is also included as a separate PNG file. 8 3x4 journal card templates! Each card comes as a psd and tiff file. KINDRED celebrates the connections we have with others, the families we are born into and the families we create with our friends, our tribe. Those special relationships and all of the moments we share are the heart of KINDRED. The kit contains: 26 3x4 journal cards in both vertical and horizontal orientation with many alternate colorways, 7 4x6 journal cards in both vertical and horizontal orientation with many alternate colorways, 4 4x4 journal cards, 99 elements, 11 solid papers, 1 alpha and 1 template. Love this kit? Be sure to check out our Memory Pockets Monthly subscription. Get the current month's kit for only $7.99 plus 35% off all add-ons and past kits.